After more than an hour of cycling, I’d travel perhaps six miles, but every minute of struggle was rewarded. Though I only cycled a small slice of the South Downs between Falmer and Southease, I felt I’d seen a wide swathe of England. When my eyes weren’t on my wheels grinding over the chalky hills as I leaned into fierce gusts cutting across my path, I admired the poppies and lavender, and the acres of fuzzy grass awash in golden light. All the images can be seen in full resolution by clicking on them. The trail made me feeling amazingly small. We spend most of our days surrounded by constructions tooled to our size and purpose. We fill our chairs, clutch our cups, and pass through portals and gates barely higher or wider than our bodies. Exposed on the downland, where the wind seems to descend straight from the sky, watching walkers and cyclists, sheep and cattle slowly making their distances, it was impossible not to feel thrilled about how all the towns were simple, small mounds pushed together by little groups of determined specks. I bumped down a descent through a pasture, riding my brakes to nearly a standstill, leaving the South Downs Way for the road from Southease to the coast. I picked up the NCN Route 2, which runs most of the southern coast of England. Though I’d left the South Downs Way, I hadn’t left the Downs themselves, and within a few miles I was climbing more cliffs and peering out over the English Channel and watching ramblers walk the Seven Sisters. Having spent more than half my day traveling just a third of the day’s trek, I already felt squeezed for time, but every few miles the land invited me to linger. 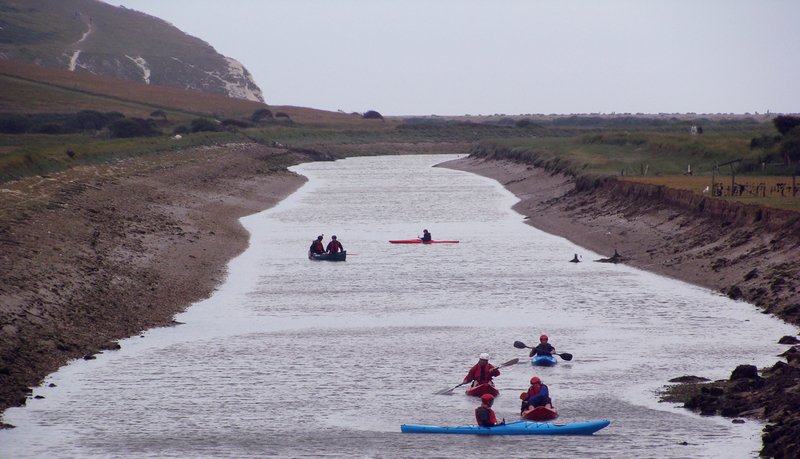 Even as I reveled in my place on the cliffs, snacking on sourdough and smoked cheddar, I wished to join those I could see below kayaking the Cuckmere River or surfing the Channel, or the pilot who glided by in a small prop plane. But I’d set the pace for the day, and with nearly 60 miles to ride and over a kilometer of climbing I’d resigned myself to exploring the geography in only one way for the day. But once I’d cleared the Seven Sisters, the coast was a blur. From Eastbourne to Hastings, I kept my head down and my feet spinning until I wheezed my way up a road so steep that at one point I had to get off and push (which was not much easier). Another 12 miles to Rye and I was rescued by my host for the night, Ben, who helped load my cycle into the back of his van and took me to his house where I could ease off my aches and hunger. Ben and I commiserated over the hill in Hastings while he fixed dinner. He had faced the same hill in the first miles of his tour around the entire coast of the island. He sat down with me and my map to review my route and pointed out a cement path missing from the map connecting coastal towns where the cycle route made a wide departure inland. After exchanging stories from our tours, we settled into pizza and beer while his terrier, Doodles, paid me plenty of attention hoping for a share of my slice. In the morning, well-rested and well-fed, Ben dropped me back in Rye to pick up my cycling. Rain drummed lightly on my helmet while I headed for an enormous shingle beach wasteland, Dungeness. 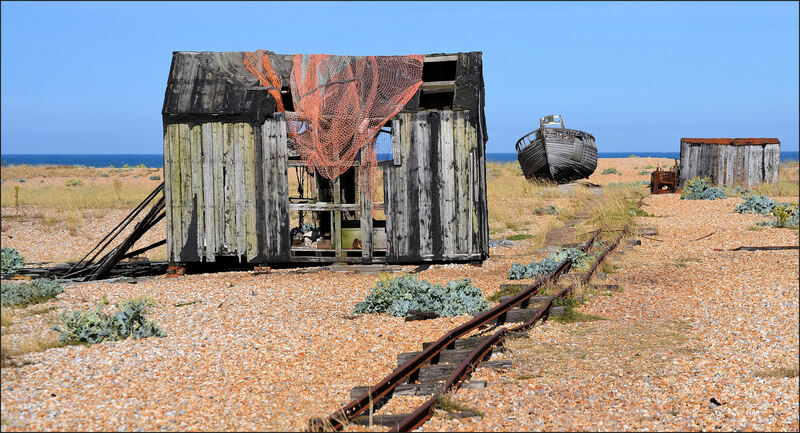 In contrast with the rapidly eroding Norfolk coast, the sea has actually retreated at Dungeness, exposing the stony dry expanse which qualifies as Britain’s only desert. But calling it a wasteland isn’t quite fair, even if it looks like a scene from dystopian sci-fi, complete with a pair of nuclear power stations. Pits left behind from excavation of pebbles (a useful construction material) have been filled to create ponds and lakes which along with nearby marshes are homes for dozens of species of bird. Meanwhile, among the shingle itself some of the birds camouflage their eggs among a thriving habitat of lizards and insects. Unfortunately, without binoculars, most of the numerous birds lay too far afield for me to distinguish any species except those I’d already seen on my other adventures. 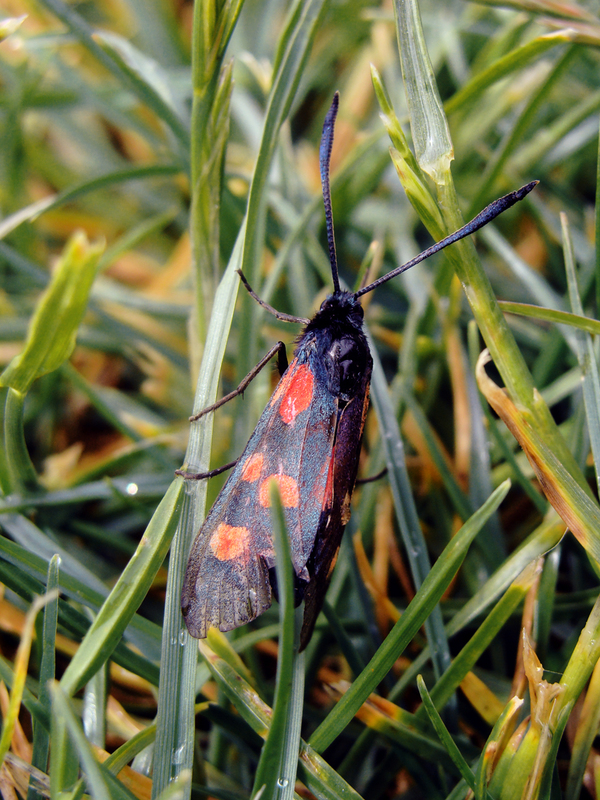 Similarly, without a guide to bring my eyes to focus on the smaller wonders laying much closer by, I’m sure I missed out on much of the life skittering through the rocks. I also missed out on touring the power station, and took a turn too early to enjoy the starker side of the stone spit. But the rain was driving me on. Sixteen miles more along seawall, cottages and caravans on one side no higher than the waves on the other. As I rode into Folkestone, the tide had climbed the lowest platforms of the causeway above the beach. Ramps ran into swell. I climbed too, away from the coast along the Chalk and Channel Way for my final approach to Dover. Past an isolated motocross track atop the cliffs, where bikes sliced through sky with no backdrop of buildings or hills or trees, I paused at one of the WWI listening ears that line the sea to have one last look back at Folkestone. 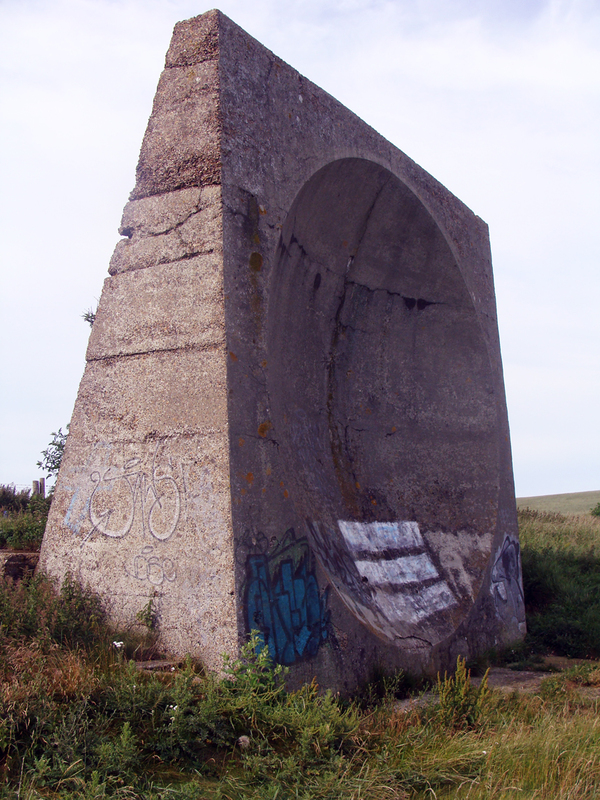 Before the invention of radar, spherical acoustic mirrors were used to detect the approach of aircraft. From there the downhill to Dover was fast and easy. Already getting on to 6:00 p.m., I decided to forego the last climb into the famous cliffs and instead settle for admiring the cliffs and castle from the harbor where ferries carry travelers to Calais. Though I felt a bit like I was giving up on my ultimate goal of the trek, after The Seven Sisters the day before, I couldn’t feel much disappointed in myself. The town didn’t seem disappointed either, as I made my way to the town center a parade passed with glorious fanfare. I dismounted and walked up to marvel with everyone else. I have no idea on what occasion they were parading, but given how far I’d come to arrive at this square at this moment, it was hard to feel that it wasn’t for me. This entry was posted in travel and tagged Brighton, cycling, Dover, narrative, South Downs, Warm Showers on July 11, 2014 by Dylan Bargteil.